I'd say the missing words are "dos" and "siphers," misspellings of "does" and "ciphers." What a great inscription! I think it's "This good old book/ Enny Man or Woman this book dos take/I will nok him down with a stake". 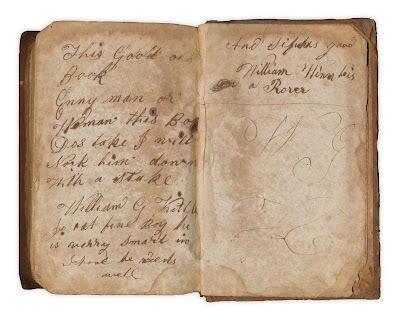 Can't make out the rest of it, although it looks like it's signed "William and Rover". Barring misspellings in the original text: "This good old book. Any man or woman this book does take I will knock him down with a stake. William G (Last name) is a fine boy, he is very smart in school, he reads well and ciphers good. 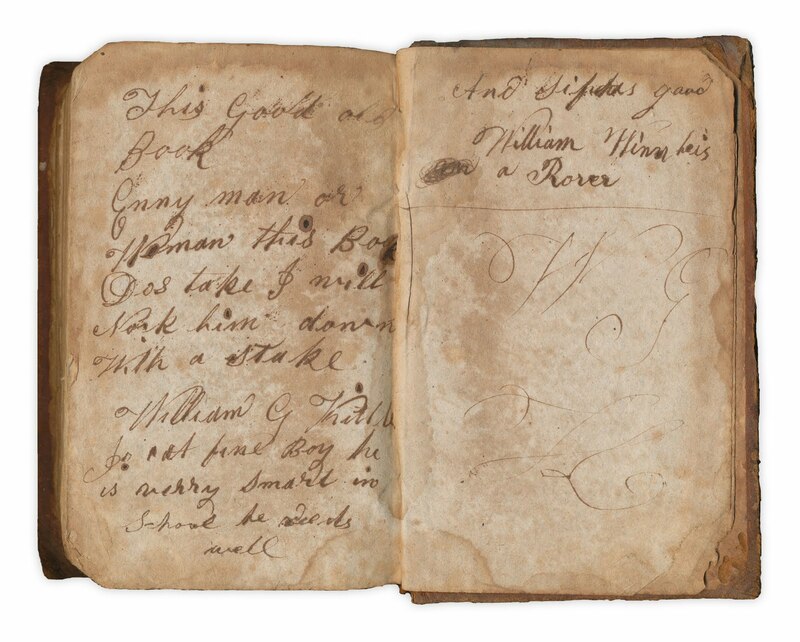 William (Last name) he is a rover"
I agree with the others. I got: "Enny man or woman this book dos take, I will knok him down with a stake. William G. Kettle. For a fine boy. He is verry smart in school. He reads well and siphers good. William Him he is a rorer." Maybe rorer is funny? I love this blog! I remembered hearing about it a while back, so I looked for it today. I posted a link on my own book blog because my son found a fun forgotten bookmark in one of our own books recently! I think the last word is Rorer - roarer - meaning a loud disorderly person.